Flyer marketing is a traditional method that many businesses still continue to practice. In the digital world, does it still make sense? Absolutely, if done correctly. Get inspired and learn how to use QR Codes on flyers effectively. Are flyers still effective in marketing? Flyers remain valuable; people love tangible things they can hold with their own hands. People can easily save a flyer in case they don’t necessarily need it right there and then, but think that they might make use of it later. Flyers are a good reminder for them to pin to the fridge or on a board in their office with your information front and center. And yet, you often see flyers ending up in the bin after people have skimmed through it. Why? Well, there are a number of factors such as the design of the flyer and usefulness of the information included. A clever marketer considers these factors to create an engaging flyer. How do I use QR Codes on flyers? QR Codes on flyers are the perfect medium to bridge the gap between the real world and online. Using a mix of traditional and online marketing only increases the chances of visibility and impact of your business. It is essential that you give customers a way to connect with your brand even after the flyer has had your customer’s attention. You can easily do this with QR Codes since there’s a Code type for every marketing goal. For example, a new restaurant could include a PDF QR Code on the flyer so that customers can scan it to conveniently get to the online menu. Coupon QR Codes can be used for discounts and sales promotions, Event QR Codes to provide details of an upcoming event, and Social Media QR Codes for growing followers on Facebook, Twitter, Instagram and other platforms. Check out our complete list of QR Code types here. What should I put on my flyer? Every flyer should start with a catchy title or headline in order to draw attention followed by a short description of what you’re advertising. Customers want to know how your business will benefit them, so be clear about what you can do. They may need your product or service but don’t know it until you tell them. To give an extra push to interested customers, consider an incentive like a coupon or discount offer on your flyer in the form of a Coupon QR Code. Always add your contact information whether it’s your website, phone number or email address so customers know how to get in touch with you. If you have a designated contact person, look into the vCard Plus QR Code. To give more details about your business such as opening hours and services offered at your location, check out the QR Code for Business. Provide a way to make it convenient for your customers to connect with your brand even after the flyer is long gone. How do I design QR Codes? QR Codes are easily customizable which makes it easy to pick color themes that match your brand or campaign. It is also important to add a call to action next to your Code so customers know what to expect when they scan. QR Code Frames are ideal for this purpose since they come in a variety of designs and messaging. Also consider the size and placement of the QR Code on your flyer. Keep in mind that if the Code is too small or isolated from the rest of your interesting content without a Frame or call to action, customers won’t scan it at all. In general, QR Codes should be at least 2 x 2 cm (around 0.8 x 0.8 in). To increase your chances of getting more scans, place it towards the center of your layout for easy scanning accessibility and make it as large as possible. 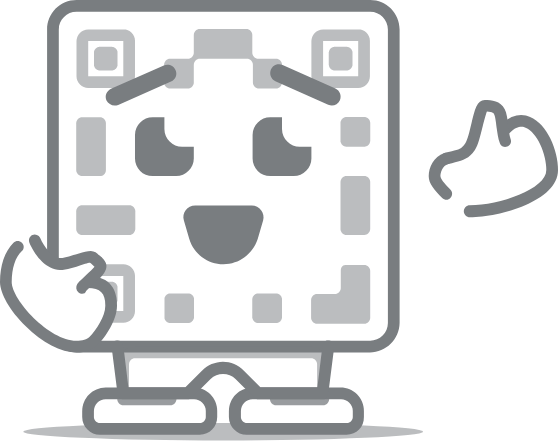 The goal is to attract user attention and make them scan your QR Code. For more tips, check out How To Get Creative with QR Code Design. How do I print QR Codes? When printing, wisely choose the finish of your flyer. The type of paper you choose will have an impact on your brand image such as that gloss can appear more luxurious, while uncoated paper will have a more natural, “earthy” feel which is ideal for brands wanting to promote being eco-friendly. Be wary of choosing a finish that reflects too much light and competes with the scannability of your QR Code. Use your best judgement and make sure to test so it’s scannable. Get more tips on how to print QR Codes here.